Camouflage is a way to mislead the sense organs like eyes, nose or tongue into perceiving something different. 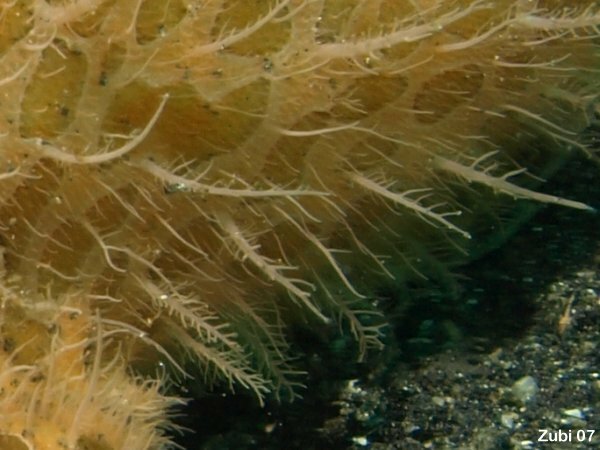 Most animals use camouflage to hide from possible predators (= protective resemblance). 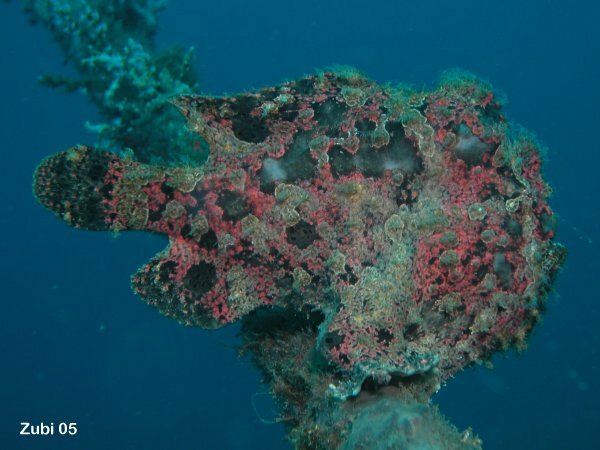 In contrast the frogfish signals to other animals, that it is a place of shelter (rock, sponge) or a grazing ground (if is looks like algae). 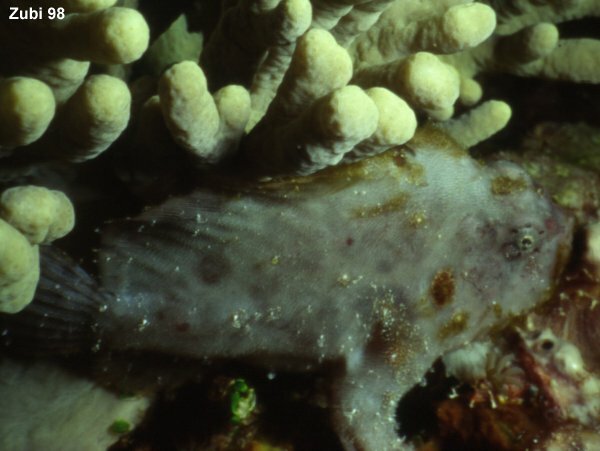 Having perceived the frogfish as nothing threatening, these animals approach and then get eaten. This is called aggressive resemblance. 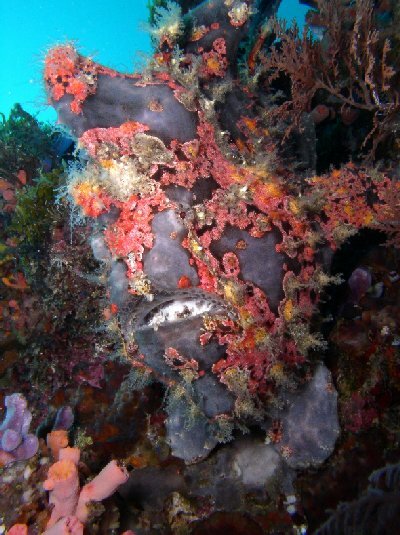 The frogfish is a master of camouflage. 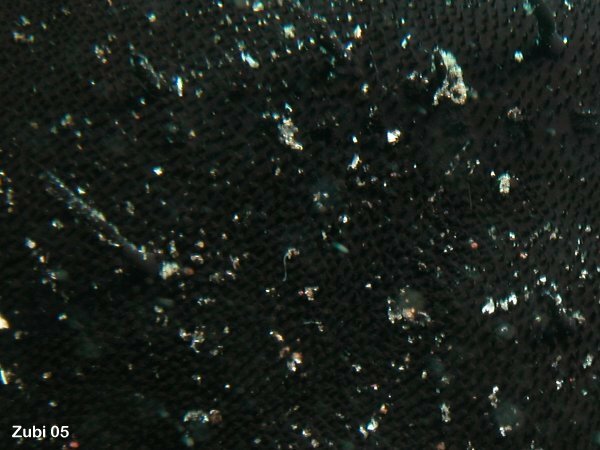 His body is often covered with spots, stripes, warts, skin flaps and filaments. 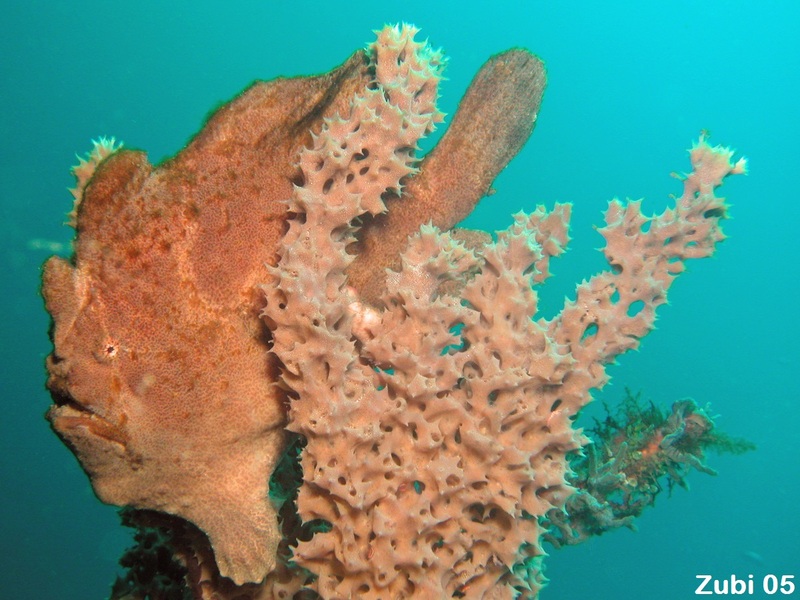 The frogfish mimics substrate and structures like algae covered rocks or rubble, plants like Sargassum weed or algae, and animals like tunicates, corals and sponges. 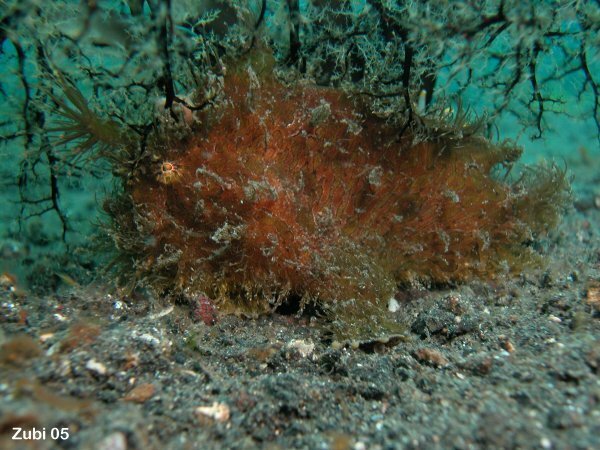 For example the striped frogfish (Antennarius striatus) looks with the help of skin flaps and appendages just like the algae it is hiding in. 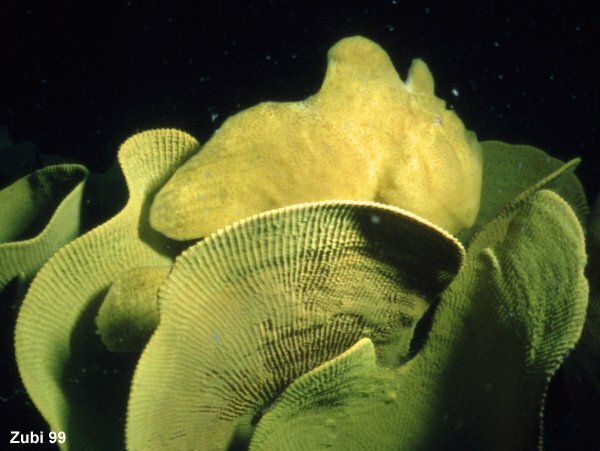 Other frogfishes look like sponges, down to the openings they immitate with spots on their skin. 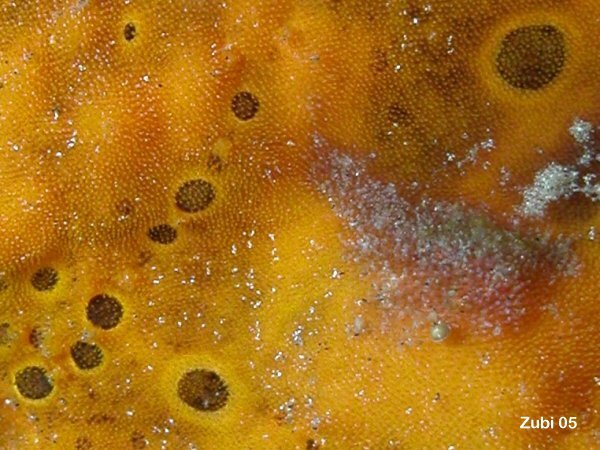 A newly discovered frogfish species (Histiophryne psychedelica) has stripes are all over the body that look like the patterns found on stony corals or bryozoans. 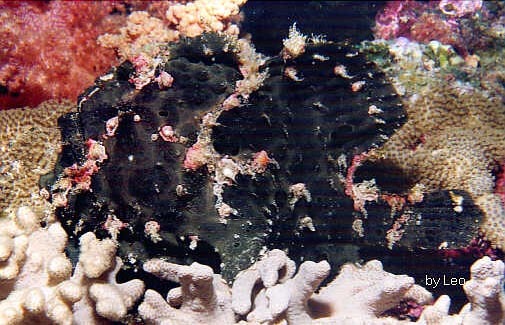 The following photos show camouflaged frogfishes. Click on thumbnail for enlargement. Click here for a list of the colors of the 48 (53? 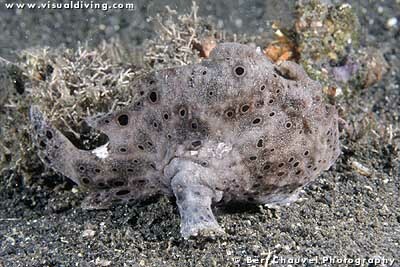 )species of frogfish. 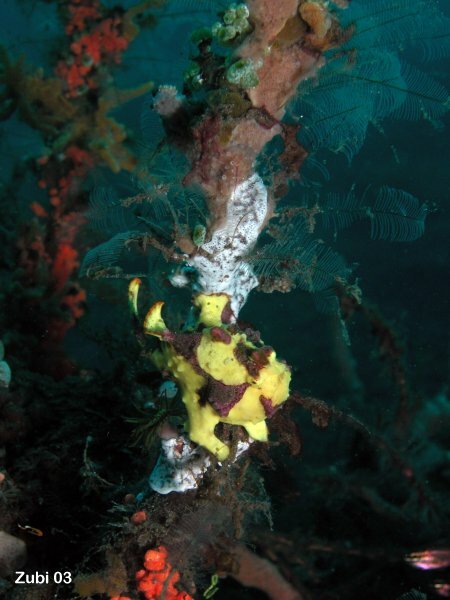 Because of their camouflage frogfish are difficult to find and - because they assume various colors - even more difficult to identify. 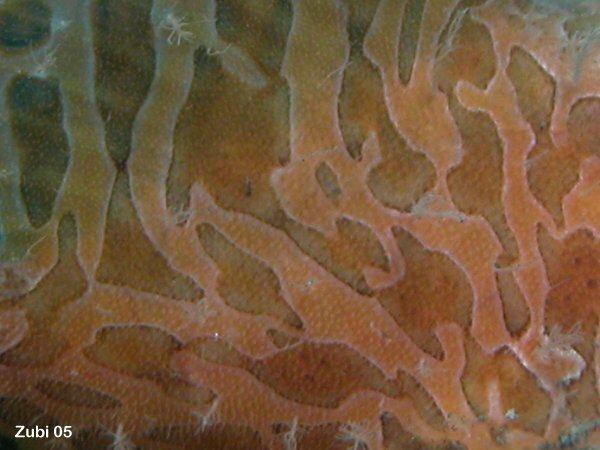 Individuals of the same species can look to us completely different. 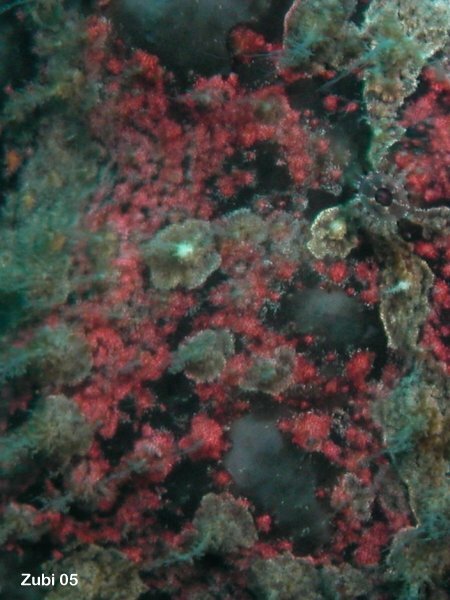 To compound the problem most frogfishes can change their color in a matter of days or weeks. 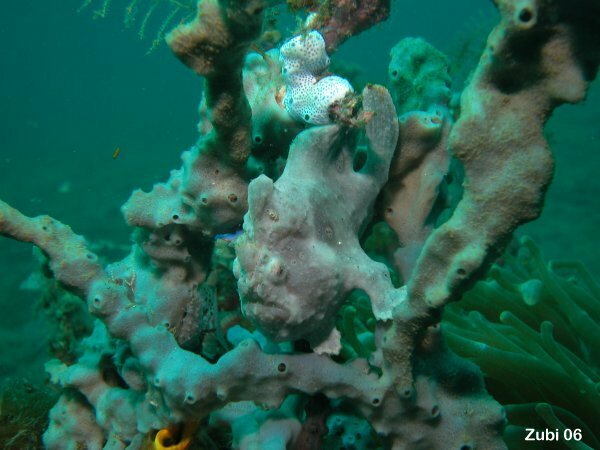 They mimic some objects in their immediate vicinity such as sponges, rocks, corals, tunicates. 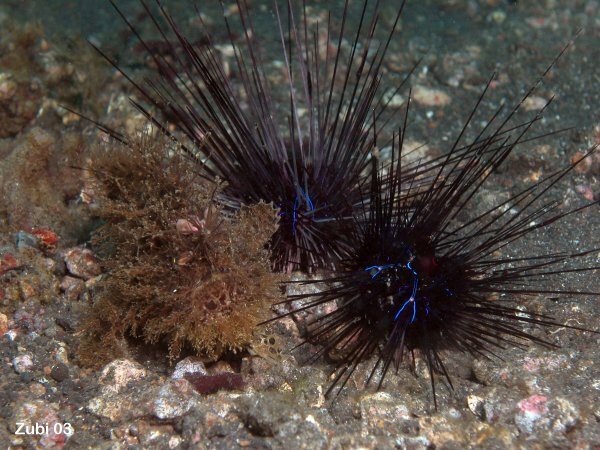 If they move to darker surroundings their body will adapt and change to a darker color. 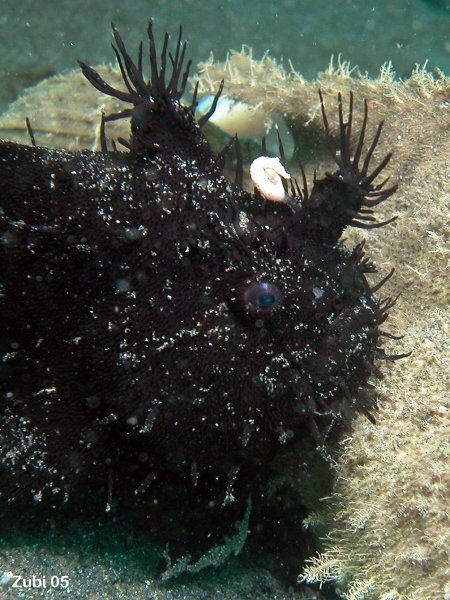 You often find black frogfishes on black sponges or close to black tunicates and yellow frogfishes inside yellow sponges and the patterns on frogfish skin often resemble the openings (ostia) of sponges or the apertures of sea squirts. 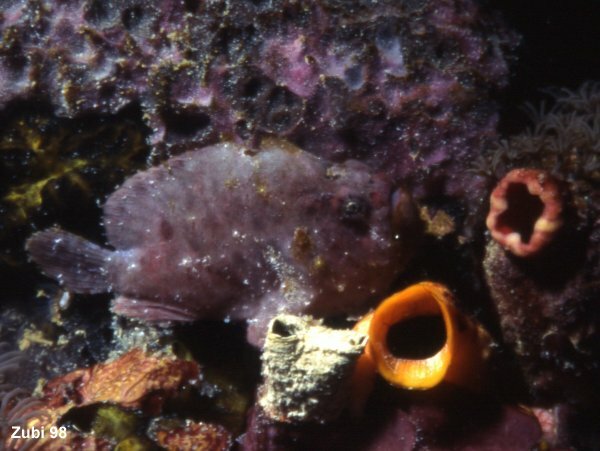 The aggressive mimicry and the feeding behavior of frogfishes is one of natures most highly evolved example of "lie-in-wait" predation. 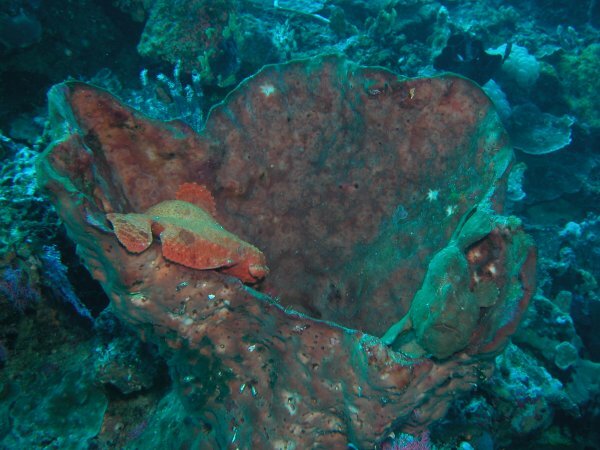 In an aquarium you might be able to observe, that a frogfish changes its color to blend in with its surroundings, taking the color of a sponge or a coral. 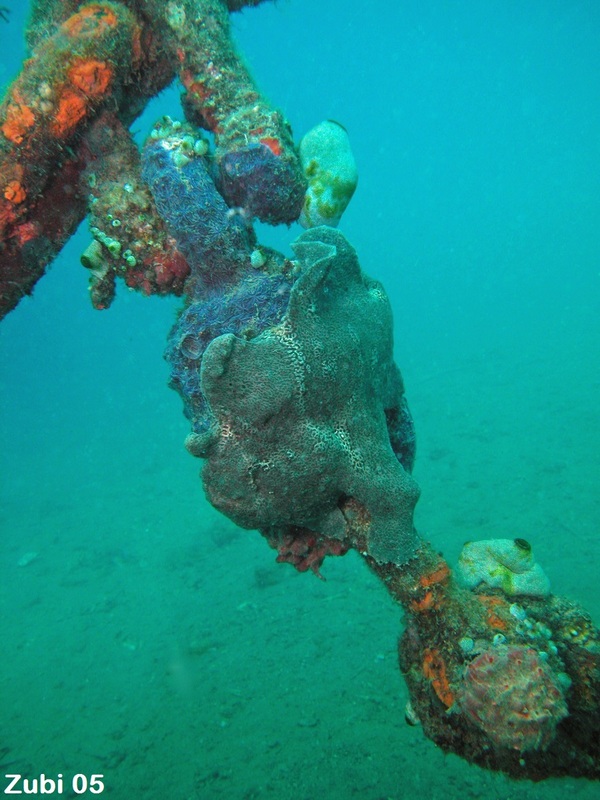 S. Michael has described a black frogfish with orange spots which turned over a one-month period first brown and then yellow with black spots. 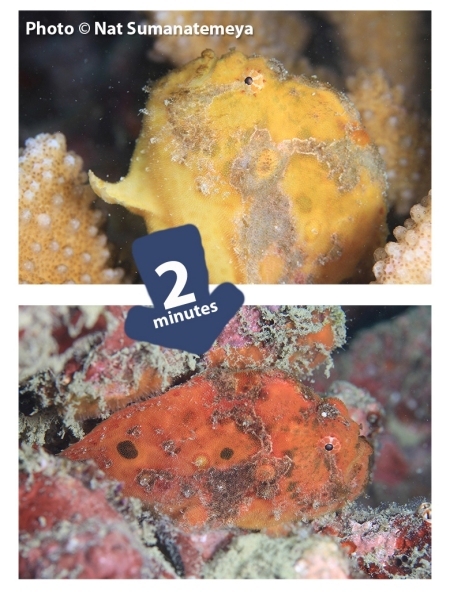 However perhaps the color change can also happen faster - during a dive the following photos of the same frogfish were taken only 2 min apart and you can see a color change from yellow to redish. 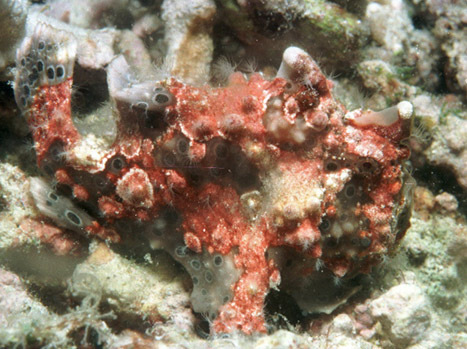 Some frogfish species like all the Antennatus species don't change colors at all, only some individuals are slightly darker or lighter colored. 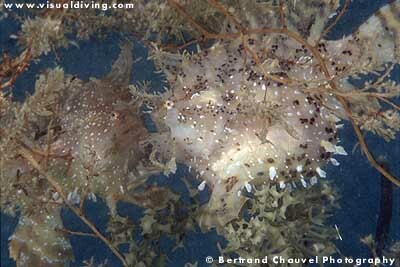 The following photos were taken of the same frogfish (Antennatus nummifer, ca. 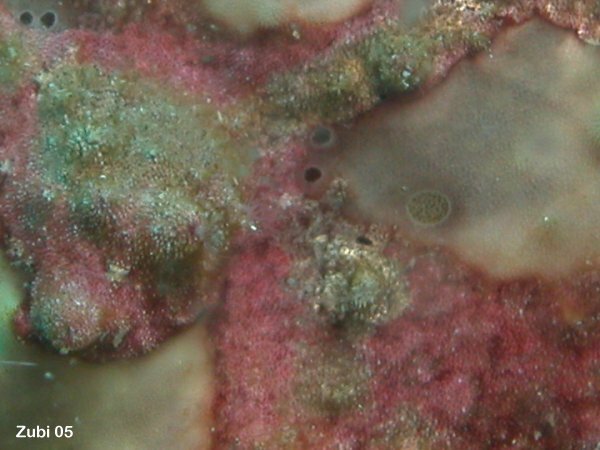 7cm) at the same coral block but three days apart. 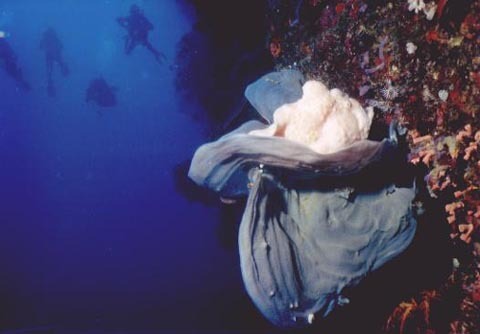 The frogfish changed from pinkish to whitish.